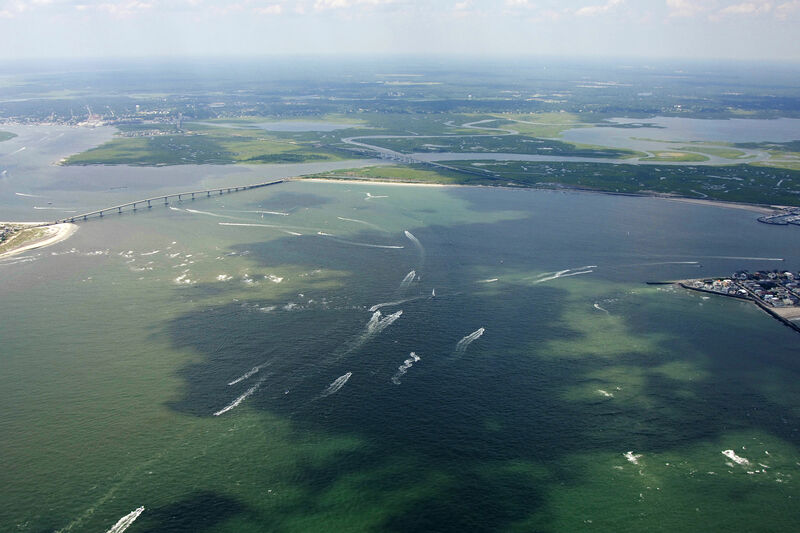 One of the more reliable passages to the ocean on the New Jersey Coast, Great Egg Harbor Inlet is fairly reliable during most weather, but should only be approached by boaters with advance local knowledge. The Great Egg Harbor Inlet is nine miles southwest of Absecon Inlet and Atlantic CIty and 33 miles northeast of Cape May. 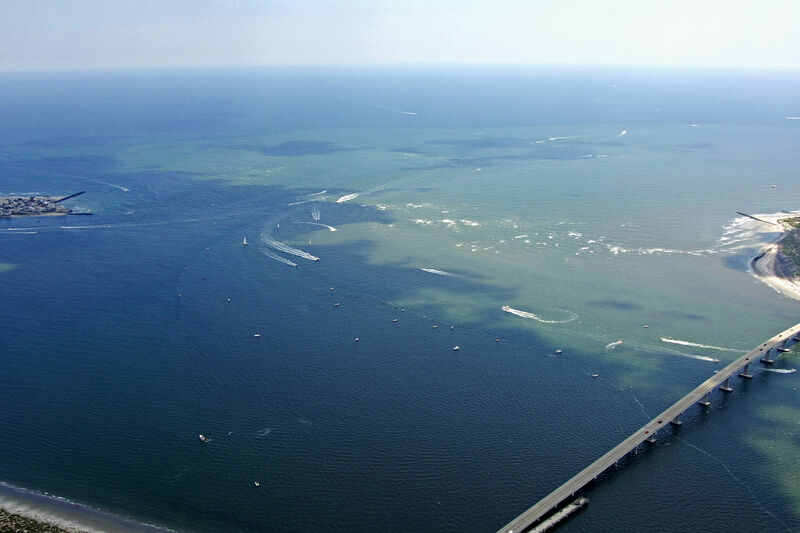 Like many inlets along the New Jersey coast, most of Great Egg Harbor Inlets buoy system is uncharted. A few times a year, a Coast Guard survey crew works the inlet and moves buoys to reflect the areas with deepest depths. 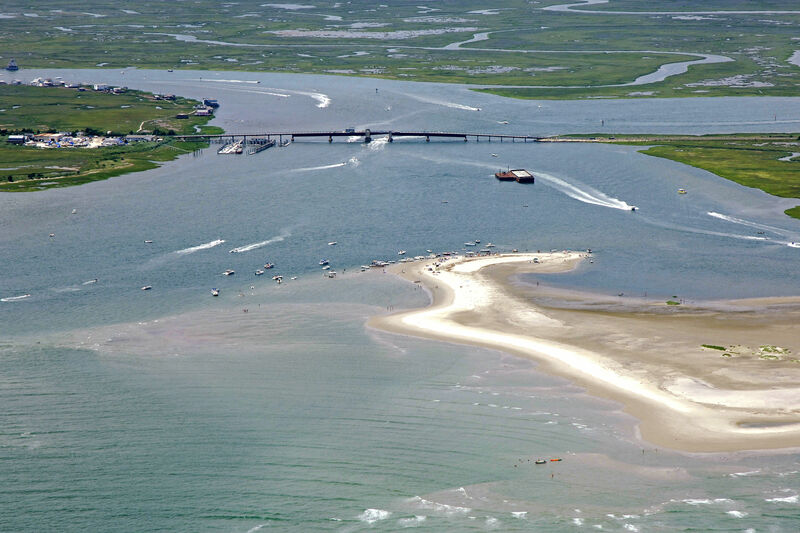 In reasonable weather, the Great Egg Harbor Inlet is safe to travel, and depths in most places are a minimum of five feet. As with any unknown inlet, we recommend radioing or calling ahead to one of the local marinas for advice on transiting the inlet. If you are approching from offshore, you first mark to pick up is red and white Morse (A) buoy GE, which is about two miles southwest of the north side of the inlet. 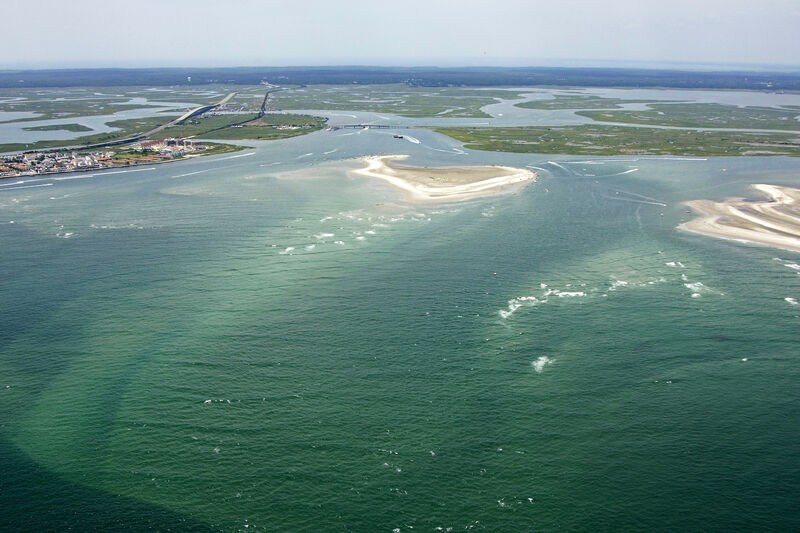 Once you have cleared this mark, pick up the series of uncharted marks into the opening of the inlet, noting that the north side of the inlet is favored, but an extensive shoal (visible above) does skirt the edges of the inlet channel. Once inside, you can head toward the south to Ocean City or Somers, or to the north toward Margate City. There are three primary locations for marinas in the Great Egg Harbor Inlet area. 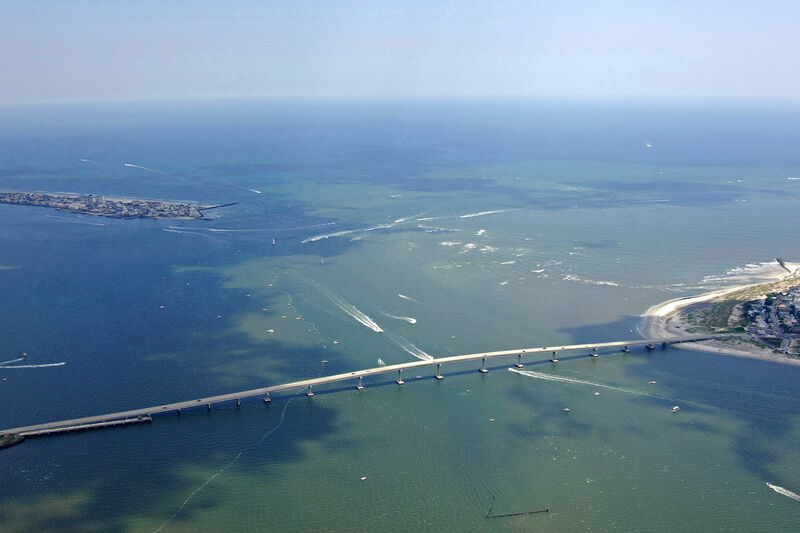 The first is to the north in Margate City past the 25-foot fixed vertical clearance bridge. Here you will find eight marinas along the waterfront on Beach Thorofare, but unfortunately none of them publicly advertise the availability of transient slips (you might try a call ahead if you are in a pinch). 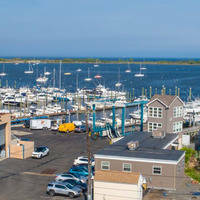 There is gas and diesel fuel available at a few of the marinas, however. South of the inlet past the 23-foot closed vertical clearance bridge at Ocean City are nine marinas along the waterfront on Rainbow Channel. One facility here will accept transient guests (you may be able to arrange for one with the others by request) and there are also a number of fuel docks here for top offs. No lifts in the area for heavy-duty repairs, however. 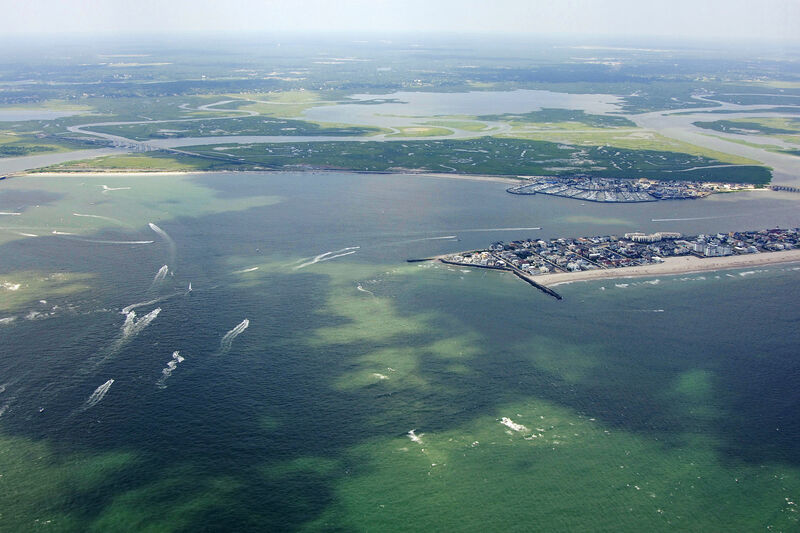 Farther to the east of Ocean City on Ship Channel is the town of Somers, which has 11 marinas just north of the 14-foot closed vertical clearance bascule bridge. Here you will find the greatest concentration of marinas with the best services. 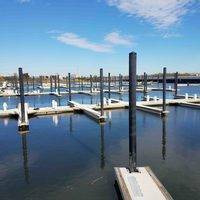 There are at least a half-dozen marina facilities with transient facilities, another half-dozen with fuel, and quite a few with repair capabilities. No reviews yet! Be the first to write a review of Great Egg Harbor Inlet.